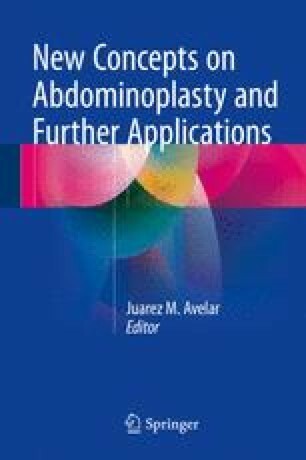 My original publications were concerning descriptions of a new technique for patients presenting abnormalities on the abdominal wall: excess skin, localized adiposity, redundant panniculus, striae, muscular flaccidity, and diastasis of the rectus abdominalis. Therefore new surgical principles were described as follows: (1) The operation is performed as a closed vascular system, which represents new concepts for improving the body contour. Since the vascular network is not damaged, the perforator vessels supply the abdominal panniculus. (2) Full-thickness lipoplasty is made on the areas where skin resection will be performed. (3) Deep lipoplasty is performed on all abdominal regions that present localized adiposity on the remaining panniculus. (4) Full-thickness skin resection. (5) The cutaneous excess is resected on infraumbilical and/or submammary regions after full-thickness liposuction of the panniculus. (6) Do not perform cutaneous or panniculus undermining, as used to be performed on traditional abdominoplasty. (7) The connective tissue and all vessels of the skin on resected areas are also preserved. This prevents the destruction of perforator vessels and small vessels coursing perpendicularly from the communicating network vessels situated in the fascia superficialis provided by the subdermal vascularization. (8) Perforator vessels are preserved during operation which works afterward as multiple pedicles providing adequate blood supply to the remaining abdominal panniculus. (9) As perforator vessels are a neurovascular pedicle since there is a sensitive nerve that passes together with the artery and veins which is not damaged during surgery. For this reason the sensibility of the remaining panniculus after is preserved. (10) The lymphatics surround the arteries and veins and are preserved, since the perforator vessels are not cut. Therefore, the lymph coming from the abdominal panniculus maintains its normal circulation after surgery, avoiding seroma formation. (11) Cauterization during surgery quite often is not necessary since there is no damage to the blood vessels. (12) Differently from the classical abdominoplasty, in which drainage is an important procedure, in this new surgical technique drainage is not necessary because there is no bleeding during or after surgery. (13) Blood transfusion used to be a necessary support until 1998 because traditional abdominoplasty operations caused so much bleeding. Nevertheless, in the use of new concepts for abdominoplasty, blood transfusion has not been necessary since there is no bleeding during or after surgery. (14) The new surgical principles are employed for treatment of localized abnormalities on several regions of the human body such as aesthetic surgery of axial, rhytidolipoplasty, ear reconstruction, lower reverse blepharoplasty, aesthetic surgery of the buttocks, medial thigh lipoplasty, torsoplasty, and flankplasty. Lower lipoabdominoplasty or lower abdominolipoplasty, when skin resection is performed on suprapubic region. Upper lipoabdominoplasty or upper abdominolipoplasty, when skin resection is performed on submammary folds bilaterally. Lower and upper lipoabdominoplasty or lower and upper abdominolipoplasty; skin resection is done on suprapubic and submammary folds bilaterally. Full abdominolipoplasty or full lipoabdominoplasty; skin resection is performed on all areas below the umbilicus on suprapubic region. In peculiar patients full abdominolipoplasty may be performed combined with upper lipoabdominoplasty.